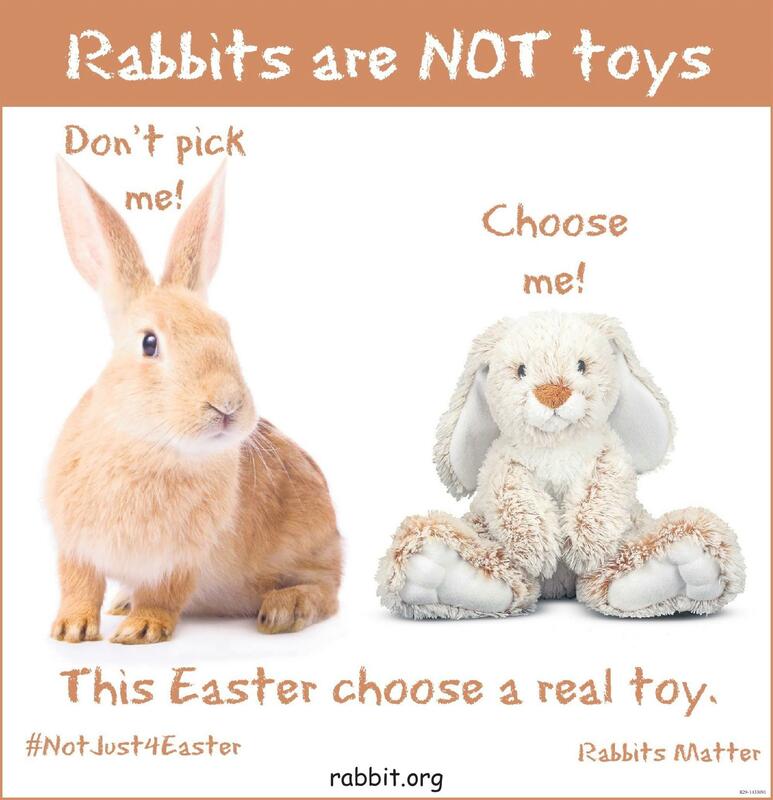 We’ve designed these flyers to help others spread our important message that “Easter and Bunnies don’t mix.” Please distribute as many as you can this Easter season. Some of these are also appropriate for all year long! 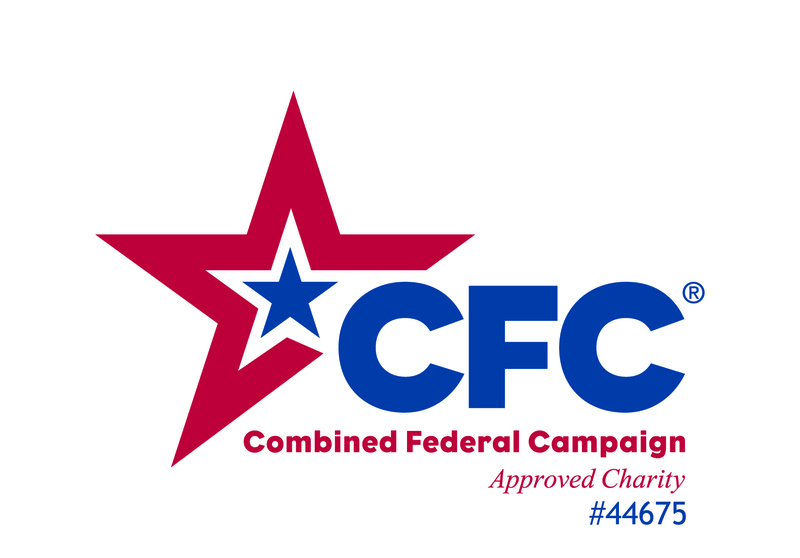 In addition to handing them out to passers by, you might also want to drop off copies at local pet stores, animal hospitals, supermarkets, or other places with public message boards. Covers all the points of our Easter message, with bold eye-catching graphics. A color flyer which encourages a stuffed rabbit as the perfect gift rather than a real rabbit. A comparison of chocolate and real rabbits for Easter. 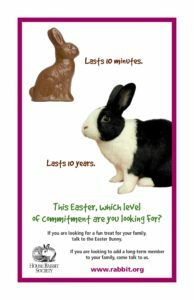 From Columbus House Rabbit Society, the Make Mine Chocolate Campaign encourages chocolate rabbits instead of real ones. 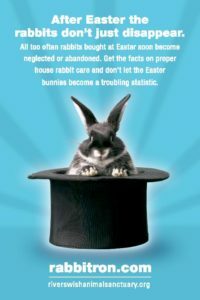 Covers the major myths about rabbits and rabbit ownership; good for any time of the year. Great comparison between buying a rabbit at Easter to buying a reindeer at Christmas. Created by Orlando Rabbit Rescue. 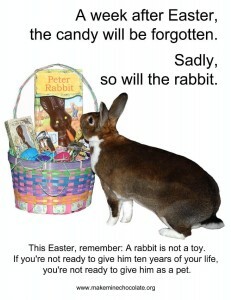 Promotes chocolate rather than real rabbits at Easter; created by rabbitron.com. 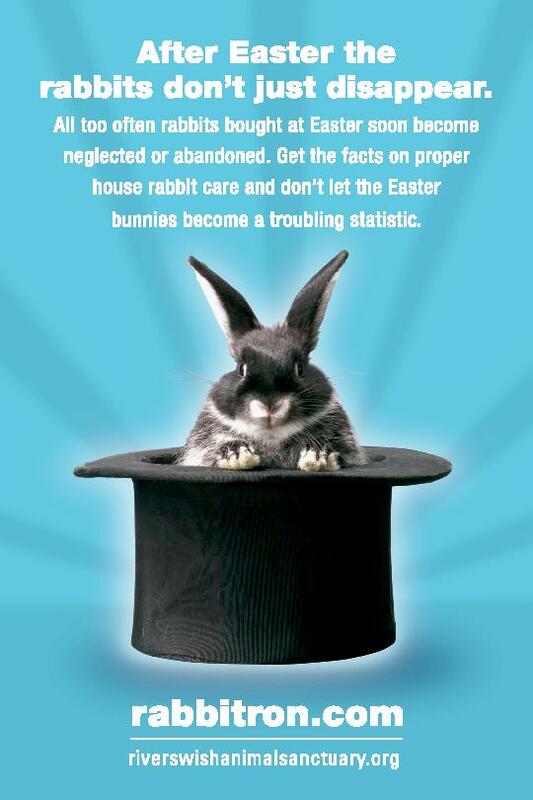 Fact sheet for Easter with a bullet point list of rabbit facts and needs, along with text describing the problems behind purchasing rabbits at Easter. 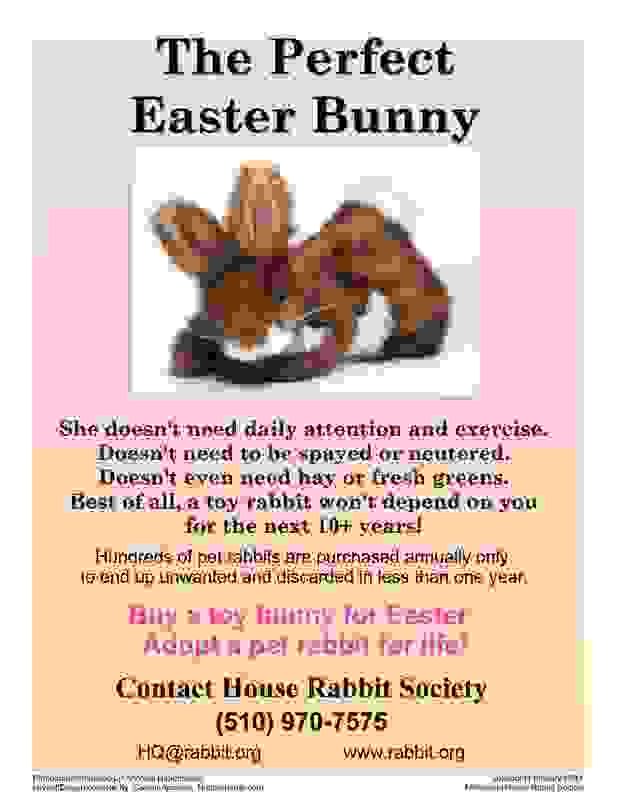 Colorful advertisement sending the message that rabbits are not toys. Created by rabbitron.com. 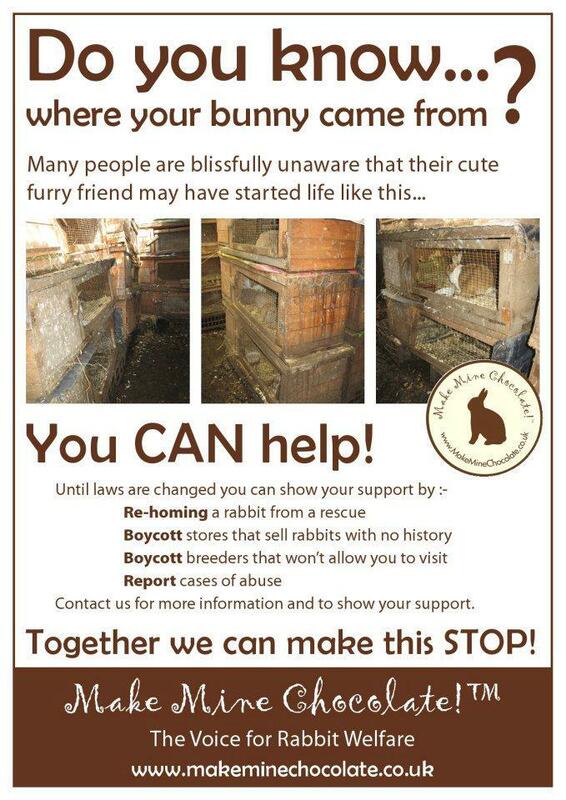 Do you know where your rabbit came from? 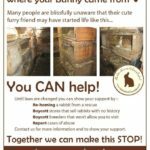 Great message about rabbit mills. Created by MakeMineChocolate.org.uk. 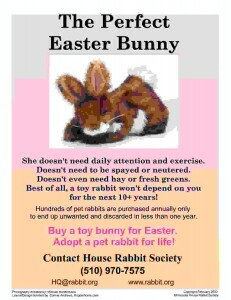 Another great flyer comparing rabbits to toys. Created by Leah Hassan.